Positional Plagiocephaly is not associated with brain injury. During an infant's first four to six months of life, the skull is naturally thin and flexible. It can easily change shape. When an infant at this stage, and regularly sleeps with his or her head in the same position, a flattening a part of the skull may occur. The "back to sleep" rule followed by parents observing The American Academy of Pediatrics recommendations for reducing the risk of Sudden Infant Death Syndrome (SIDS) may occasionally be associated with flattening of the back of a child's skull. Don't be alarmed. Over time, most children's heads will round out as they spend more time sleeping upright or in other positions. However, a few infants may continue resting their heads on one side while lying on their backs. Some of these babies may develop a more severe form of skull flattening. These babies usually were used to lying on that side of their skull in the womb and can also have their neck muscles turned to one side (torticollis). In this scenario, the side of the back of the head continues to flatten, sometimes leading to one side of the head shifting forward. From above, the infant's head looks like a "parallelogram." This condition is called positional plagiocephaly. It occurs about once in every 300 live births. Positional plagiocephaly does not affect brain growth or development. Early recognition of the problem is important. Regular repositioning of the baby from the flattened side of the skull prevents development of severe positional plagiocephaly. This repositioning can speed up the rounding process, which will help the baby's head return to normal by age four or five. Surgery is almost never required. What is craniosynostosis and how does it relate to positional plagiocephaly? Craniosynostosis is a condition in which the infant skull's joints or sutures close prematurely. In a few very rare cases one of the lambdoid sutures closes prematurely. This leads to a skull shape similar, but distinct, from that caused by positional plagiocephaly. The diagram below shows positional plagiocephaly on the left (head in a parallelogram shape), and right lambdoid synostosis on the right. The pediatric neurosurgeon can usually determine if a suture has closed, usually by simply looking at and feeling the baby's head, and not needing a CT scan. Surgery is usually needed for craniosynostosis. 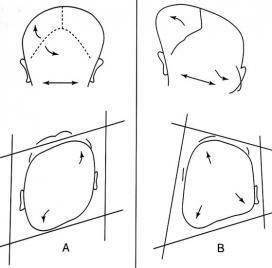 How do you prevent or correct positional plagiocephaly? Try hanging a mobile, crib toy, or light on the side of the crib you want your baby to face. You might also try propping your baby to the desired side. Be aware that certain commercial positioners are not recommended. If your child has torticollis, your doctor may recommend stretching exercises to loosen the neck muscles and encourage greater range of motion. Increase your baby's daily "tummy time." This helps your baby get used to the belly sleeping position, when he or she rolls over. You might also try a special car seat insert, which helps keep your baby's head from lying flat. If a child's plagiocephaly is severe and persistent, a helmet may be recommended. The helmet keeps pressure off the flat spot, allowing the baby to sleep in any position. Helmet therapy is best begun by 8 months of age. The helmet is custom fitted and made especially for your child. It is to be worn 23 hours a day, for about three to four months. It has a plastic shell lined with multiple layers of polyethylene foam. These foam layers can be trimmed down or shaved to allow for adjustment of the helmet as your child's head grows. Helmets should be painless and don't interfere with your child's normal brain growth and development. Helmet therapy does help the skull-rounding process but will not guarantee a perfect head shape. Plagiocephaly which may continue after helmet therapy naturally improves as your baby's skull continues to grow.